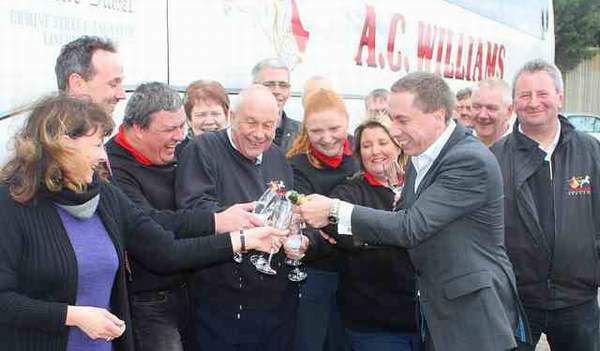 A private investor has stepped in to secure the future of A C Williams Coaches, in a move that prompted celebrations by the 25 drivers, mechanics and office staff after learning their jobs were safe. Coach and bus operator A C Williams was established in 1953, nearly 60 years ago, in Ancaster, as a motor engineer and agricultural machinery repair business, and despite a healthy demand for bookings, its future was threatened following the closure of its sister business in December, the A C Williams Renault car dealership. Now its future is guaranteed, which is good news for customers who made bookings for future trips and holidays, as deposits will be safe and trips will take place as planned. The company, which numbers Harlaxton College, The Red Arrows and football clubs Lincoln City and Boston United among its regular coach customers, has received a cash and management injection from investor Glen Pratt, who wants to save jobs by turning round small family-owned companies. He has plans to build the business through employee profit sharing and the partnership principles which have proved so successful for John Lewis. As executive chairman of the company, Glen Pratt, age 39, a successful investment fund manager in London, will be keeping not just the A C Williams family name, but the Williams’ family involvement as well, with former directors David Williams and Alison Parker fulfilling non-managerial roles within the company. The family approach will be expanded further, with financial accountant David Pratt joining his brother Glen on the board as finance director. The company started out by transporting just three children to school from an outlying farm, but it is now one of the leading providers of school transport in the county, holding major contracts with Lincolnshire County Council, transporting 500 children every day. It also runs a busy schedule of day trips and holidays, and serves many local colleges, sports clubs and businesses including Norbert Dentressangle, formerly Christian Salvesen. The company’s 20-strong coach and bus fleet covers a wide range of transportation solutions, including state of the art executive coaches, double decker school buses, together with specially modified vehicles which offer tables or wheelchair access. Under the new leadership, the company is set to expand and hopes to create more jobs in the local community in coming years.